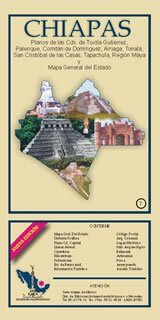 Folded color map in Spanish of Chiapas and select cities. The main state map (scale 1:900,000), Tuxtla Guterrez (1:21,000), Tapachula (1:26,000), Comitan (1:25,000), and San Cristobal de las Casas (1:23,000). Legends in Spanish and English.